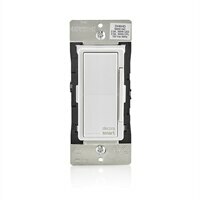 Decora Smart 600w Dimmer Homekit TechnologyLeviton’s Decora Smart™ accessories with HomeKit™ technology are designed to streamline home control using HomeKit-enabled accessories. Apple® HomeKit technology provides an easy, secure way to control HomeKit-enabled accessories using Siri® voice control on your iPhone®, iPad® or iPod touch®. After installing your Decora Smart™ Dimmer, configure it from the Leviton Decora Smart Home app with just a few simple steps. The free Leviton app provides control of connected loads, grouping into rooms and zones for easy control, as well as access to customizable lighting control settings including fade rate, minimum/maximum brightness, LED response activity, bulb type selection and more. Decora Smart devices are designed for countries which follow NEMA standards including the United States, Canada and parts of South America. Leviton’s Decora Smart™ accessories with HomeKit™ technology are designed to streamline home control using HomeKit-enabled accessories. Apple® HomeKit technology provides an easy, secure way to control HomeKit-enabled accessories using Siri® voice control on your iPhone®, iPad® or iPod touch®. After installing your Decora Smart™ Dimmer, configure it from the Leviton Decora Smart Home app with just a few simple steps. The free Leviton app provides control of connected loads, grouping into rooms and zones for easy control, as well as access to customizable lighting control settings including fade rate, minimum/maximum brightness, LED response activity, bulb type selection and more. Decora Smart devices are designed for countries which follow NEMA standards including the United States, Canada and parts of South America.